Food Back Up: Go-To Items In The Fridge | Izzy have you eaten? The weather has finally burst forth with warmth. Dad coaxed me out on a bike, after doing some lovely rides with the Barrs boys himself. Who knew this city would have a secret right at its heart, of amazing leafy trails, uphill and down, through grassy meadows, marshland, and tunnels of shady trees. We’ve had two long rides in two days. This evening we stopped at the Forest Hill shops and I picked up some fresh basil and pine nuts. Yeah, you know where I’m going with THOSE ingredients! Haha! Our current unpredictable life has meant meals on the fly, and reaching out for my ‘go-to’ items in the back of the fridge. They are such a god-send, sauces and pastes and such which quickly convert into yummy meals, or add to otherwise bland ones. When you and your sister were babies, I would use a Sunday afternoon to cook, so the work week had a bit more breathing space with meals semi, or even fully cooked, carefully labelled and frozen. I always had a few back up items prepared too, which when used with other ingredients, made an evening of ‘I’m totally stuck for what to cook’ so much easier to deal with. You grew up with these things in our family fridge, but I thought I would explain a few of them, so you could have these emergency supplies whenever you needed them too! For me, it is sanity in a jar! 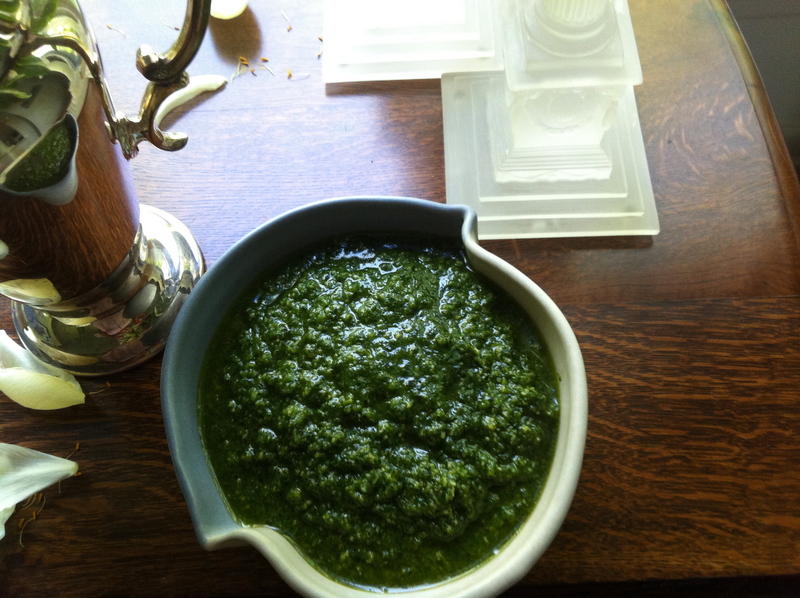 First here’s the recipe for pesto: What a versatile thing to have within reach. From when you were a baby, I’d stir it through rice or pasta, spread it on halved English muffins, top with ham and cheese and pop under the griller for baby sized pizza which you adored as play lunch after pre-school. We’d sit on the sunny deck at the La Perouse Street house, and you’d eat your pizzas out of the French enamel plate your Dadda brought you from a trip. 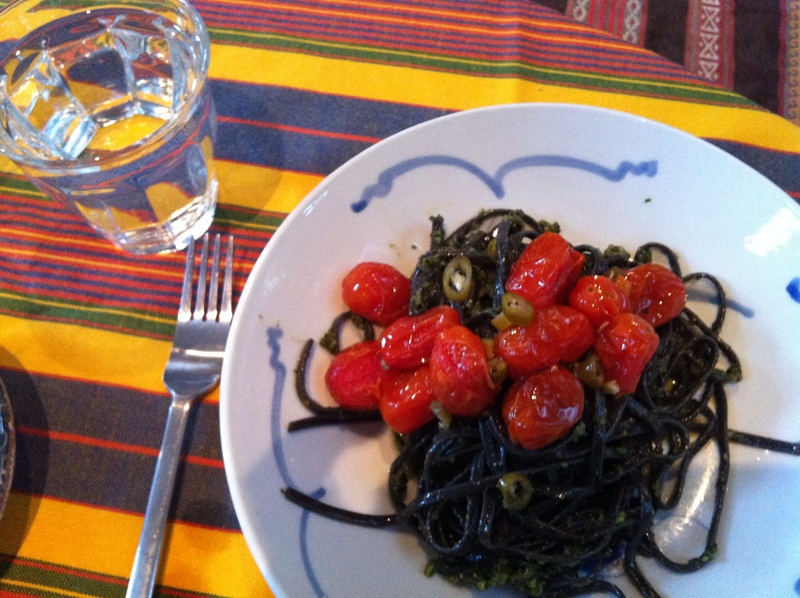 Pesto is great on squid ink pasta,with Chinese lap cheong sausage and pine nuts to garnish. Spread thickly on chicken breast and grilled, you have a wonderful fresh meal to serve with a side salad. I sometimes substitute basil with sage when there is tons in season. The sage leaves seem to go particularly well with pistachio nuts, so I make the pesto with those two instead of basil leaves and pine nuts. The pesto is a lovely pale green, and has a more woodsy flavour. Quite spesh and great to smear on grilled lamb chops. Just make sure you use tender sage leaves. Yellowy or leathery leaves will produce a bitter flavour. 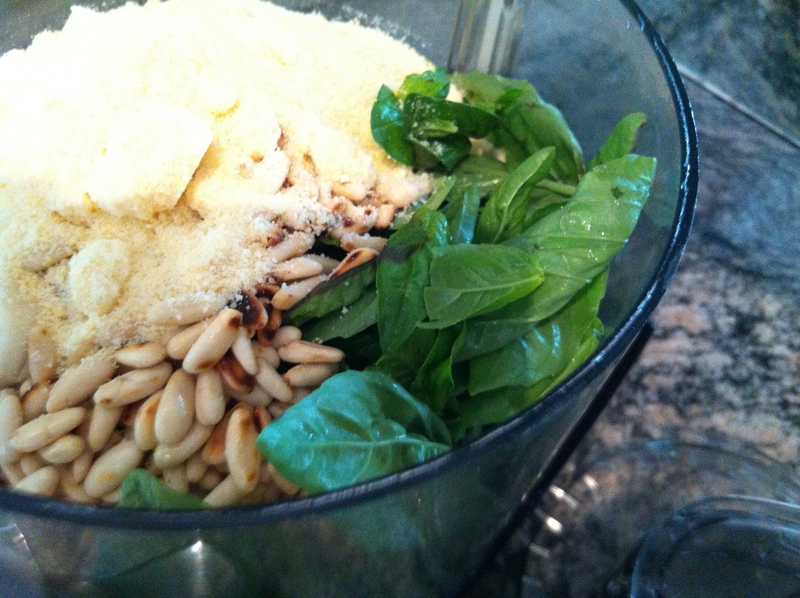 Put all the ingredients in a kitchen blender with 1 cup of olive oil, and blend till smooth. Add a little more oil for a looser consistency. Empty into clean, airtight jars. This recipe should fill two Bon Maman jam jars. Top with a thin layer of remaining oil and screw cap on tightly. You can freeze any extra jars of pesto up to two months. Leave in the fridge overnight to defrost. Another go-to quickie to put together is trout dip. 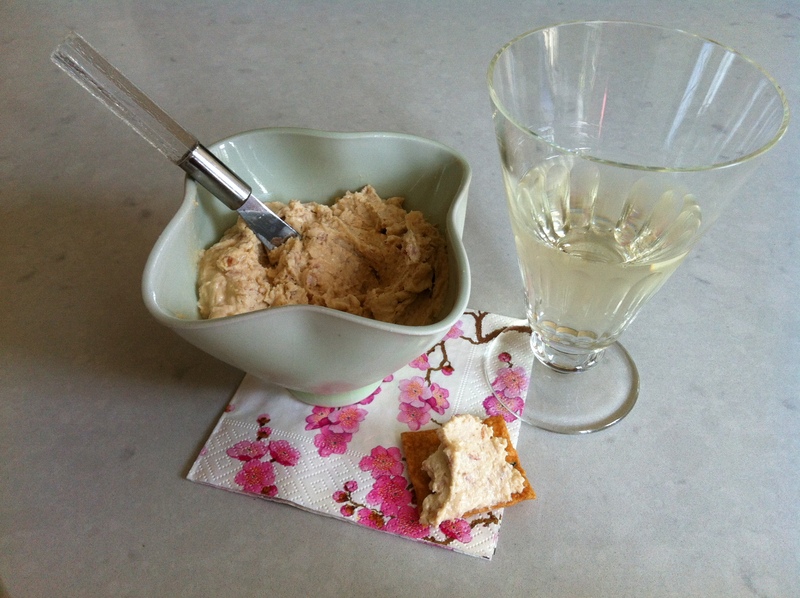 Make it for any gathering and serve with pita chips or crackers, it is a delicious and elegant tasting dip. But you can also spread it on crusty bread with your favourite greens for a great sandwich. You can make the dip with sun dried tomatoes too: just substitute the smoked trout for half a cup of sun dried tomato and presto! Another delicious dip to serve. I use the oil that the tomato comes packed in for extra flavour. Put all the ingredients except the lemon juice into a blender and whizz until creamy and light. Empty into a serving bowl and add small amounts of lemon juice and stir well until seasoned to your liking. Crack some fresh pepper over the top and serve. With all the noodles dishes we cook at home, a sprinkle of preserved green chillis on the side never goes astray. The usually hot green suckers become quite mild in vinegar, and you have the flavour of chilli but with a nice sourness which takes the edge off the heat. Have a jar in your fridge handy to have with any noodle dish, or even over pizza. Quite addictive! add about two tablespoons of white sugar, and stir well. Store for at least a week before use. Cold Cooked Rice………..Funnily enough, a plastic container of cooked rice never goes astray in my fridge and has rescued many a last minute ‘what to do’ situation. To make fried rice, one would only use cold rice so the grains stay nice and separate and the dish wont turn soggy on you. You can throw in a couple of tablespoonfuls into a green salad of peas and chopped cucumber with toasted almonds. Toss with a home made dressing and some finely chopped fresh herbs: tres chic. To thicken a big soup, or stew, a cup of rice is a perfect addition ( see my previous post on Moroccan Harira soup). And what is a leftover serve of dhal or sambar if you cannot put it in the microwave with a little pile of rice? There’s gotta be some rice, right? Add the carrots, peas, and then the rice. Pour in the two beaten eggs, and cover over gently with the rice mixture. Put the lid on the wok and turn the heat down a little. Leave to cook for two minutes. Uncover, and stir vigorously to distribute the egg mixture through the rice. 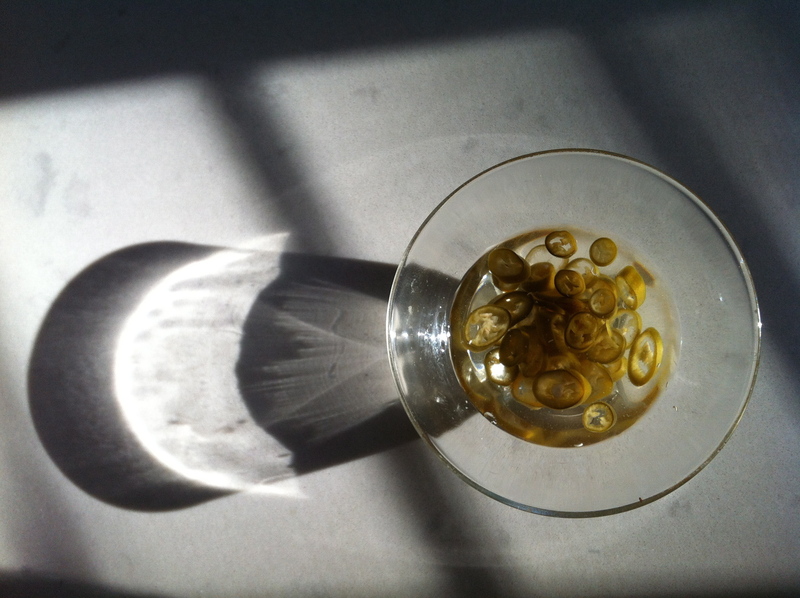 Garnish with sliced chillis ( or your preserved green chillis!) and chopped flat leaf parsley. This entry was posted in GROUP C, Uncategorized and tagged Forest Hill Shops, Fried Rice, Green Chillis, Pesto, Sun Dried Tomato Dip, Trout Dip by tgb9593. Bookmark the permalink. Pingback: Salmon in Vietnamese Sauce: Coming Back Down to Earth | izzy have you eaten ?